Obamacare’s individual mandate and its other directives are raising costs, thereby incentivizing big businesses to dump part-time workers and workers’ spouses into the Obamacare exchanges, where taxpayer get to help pick up the tab. Should We Believe Kaiser’s Obamacare Polling, or ‘Something Else’? Long a left-leaning outlier, even Kaiser’s health polling finds that voters are more apt to back congressional candidates who want to repeal Obamacare. It’s not only that Obamacare is unpopular; it’s that those who dislike it care a lot more about the issue than those who like it do—thereby making Obamacare doubly politically toxic. 100 Days of Neglecting Obamacare? It’s time for Republicans to show they’re the party of Main St., U.S.A., not the party of corporate America—and the best thing they can do for Main St. is fight Obamacare now, and repeal and replace it in 2017. One key anti-Obamacare vote would demonstrate to voters that House Republicans are more interested in fighting for Main Street Americans than in running out the clock or placating the insurance lobby. Is the establishment wing of the Republican Party starting to go soft on repeal? One of the key players in the cozy alliance between Big Government and Big Insurance doesn’t think it’s fair to criticize Obamacare’s looming taxpayer ‘bailout’ of insurance companies. Do Americans Dislike Obamacare More Than Obama Likes Golf? 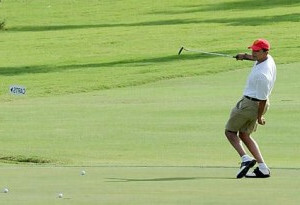 Try as he might, President Obama can’t get on the golf course as often as new anti-Obamacare polls are released.